You’ll start by crumbling the cooled cake and stirring in frosting until the mixture is like stiff cookie dough. Roll out the balls and freeze them for about and hour. Then, dip them in melted white chocolate and add sprinkles if desired. Definitely not hard, but they can be a bit time consuming. It’s fun project to do with friends for Christmas or with your kids around Valentine’s day. Although let go of perfect expectations if you let your kids help. They will have so much fun though. 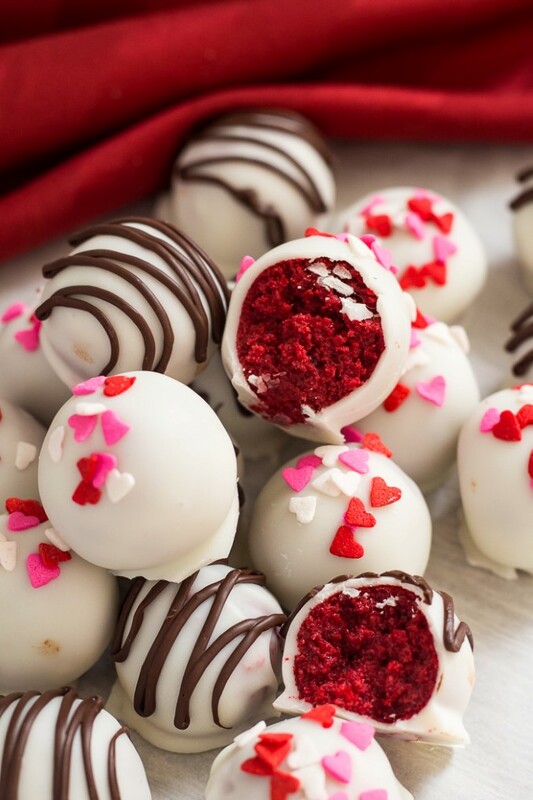 Freeze your cake balls before dipping. It makes them much easier to work with and keeps them from falling apart when dipped in the warm chocolate. Also, have everything set up with plenty of space before you begin. Have a cookie sheet lined with wax paper to set the cake balls on after dipping. My favorite way is with a toothpick. Simply stab each ball with a toothpick and dip in chocolate. This works best if they are frozen first. Otherwise, they will tend to fall off the toothpick when pulling them out of the chocolate. I’ve also used a fork with success. Simply place the cake ball on the fork and coat in the chocolate. Tap the excess off and gently slide onto the wax paper with another fork. My mint chocolate chip truffles and cookie dough truffles are two other favorites that are fun this time of year. If you have a peanut butter chocolate lover in your family, the peanut butter ball recipe (aka buckeyes) on my site is perfect for them. OREO balls are another favorite this time of year. I have a fun Lemon Oreo Truffle you should be sure to check out. 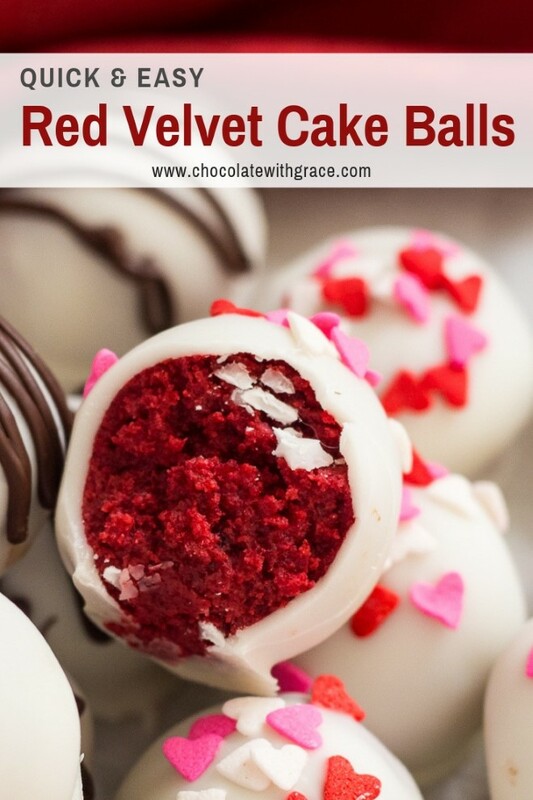 And if you’re looking for other flavors of cake balls my blogger friends have some fun flavors. 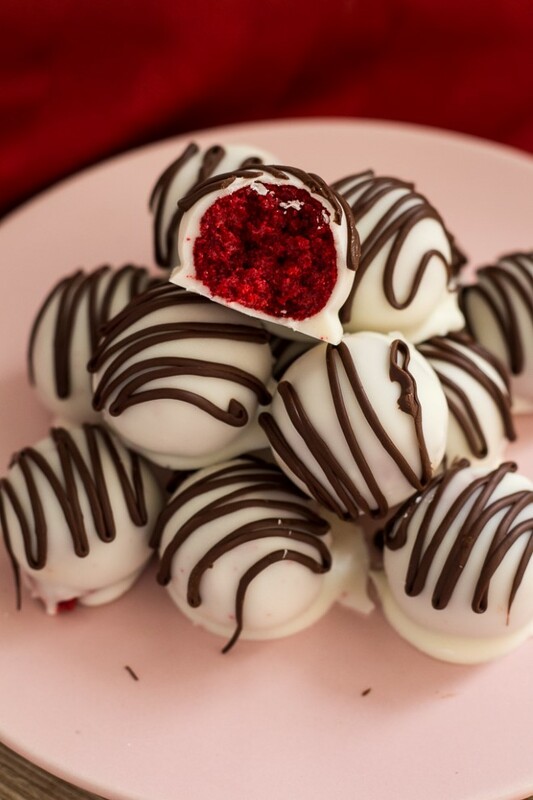 Red Velvet Cake Balls made with cream cheese frosting and dipped in white chocolate. An elegant truffle for Valentine's Day or Christmas. Bake the red velvet cake mix according to the directions on the box. Let it cool completely. It may seem dry at first, but it will take the cake a bit of time to absorb the moisture of the frosting. I recommend you let it sit for 5 minutes and come back to see if it needs more moisture. If it does, add more frosting a spoonful at a time until the mixture is a smooth workable consistency. A bit like stiff cookie dough. The amount of frosting you will need depends on how dry your cake is. Once the mixture can be easily rolled into smooth balls, roll the cake balls into 1 inch balls and place on a parchment lined baking sheet. Place in the freezer for 1 hour. While the cake balls are freezing. Melt the white chocolate slowly over a double boiler. Dip the truffles in the white chocolate using a toothpick or a fork. Set the cake balls on parchment paper to harden. If you want to add sprinkles add them right away while the chocolate is still wet. Otherwise, wait till the white chocolate hardens and drizzle a bit of melted dark chocolate over the top. They keep in the fridge for a day or two or several week in the freezer. You can use a homemade red velvet cake for this recipe. Simply bake up your favorite 2 layer red velvet cake mix recipe and let cool completely before proceeding with step 2. 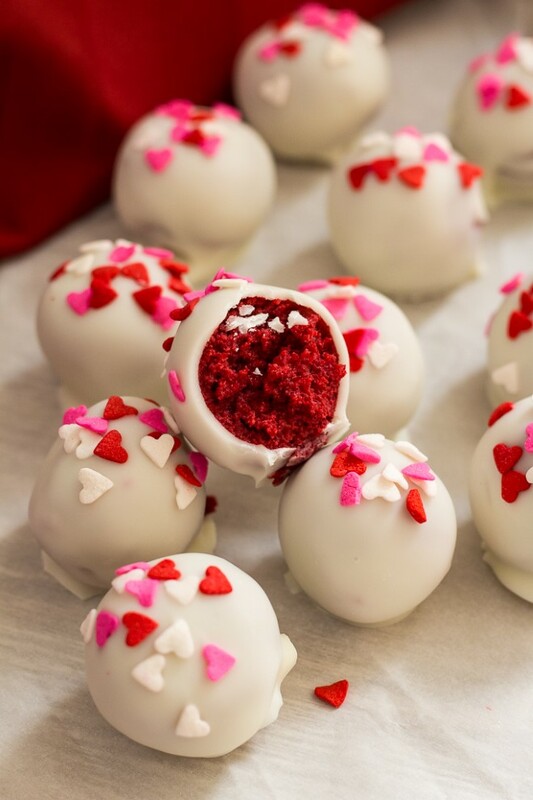 Red velvet is my weakness and these cake balls are so addicting and easy. 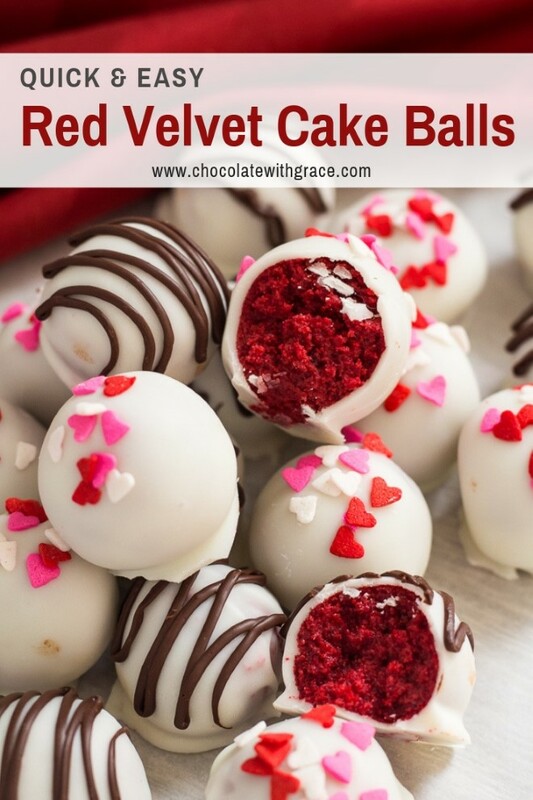 I’ve never made cake balls or cake pops but these looks super good, definitely going to try! 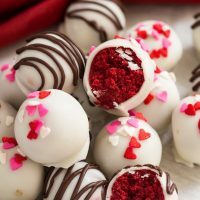 Red Velvet Cake Balls are at the top of my family’s list of favorite treats!! Oh my goodness, these are fantastic!! I love red velvet! These are my favorites. Love anything red velvet.